I've decided to start a list of my favorite Macintosh applications, more specifically applications that don't come with the computer. I know that there are LOTS of lists that you can find out there that do the same thing and I'm not about to claim that my list is better or more complete. I'm doing this mostly for my own posterity. My first app, and definitely one of the most important, is Quicksilver. 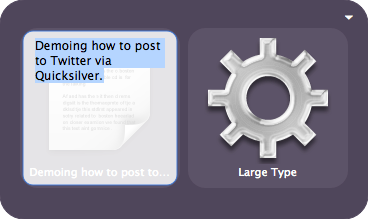 Quicksilver is a fantastic application that works kind of like Spotlight, kind of like Finder, kind of like Automator and kind of like a mouse. 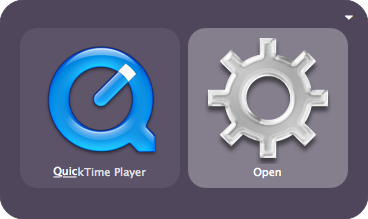 Quicksilver is an application that runs (mostly in the background) waiting for you to hit a user defined hotkey. Hit the specific hotkey, the default is Ctrl + Space, and the application window pops up (see left). The interface is broken up into two main parts. The left pane is often thought of as the object or noun pane. 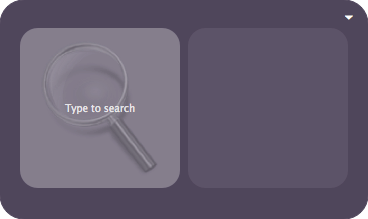 Just start typing the name of any application or folder on your computer and quicksilver instantly searches its massive index and lists everything that closely matches what you typed. If the top hit on the list isn't what you wanted all you have to do is arrow through the popup list to the one you want then tab to the n ext pane. The second pane is the action or verb pane. Here you can select any action that you want to perform on the object from the first pane. The default action is usually "Open" since that is often what you will want to do with files, folders, and applications. Just using Quicksilver like that, it becomes an alternative to the Finder and the Dock. Have an application that you use a lot, but not several times a day? Rather than put it in the dock, just let Quicksilver launch it. But Quicksilver is capable of so much more. Need to e-mail someone in your address book a file. With Quicksilver you can select the file (or files, using the "Comma Trick"), zip them together, create an e-mail, attach the files to the e-mail, enter the recipient, and send the e-mail. You can do all of that without touching Finder or Mail. One of my personal favorite uses for Quicksilver has to do with Twitter. I can write a tweet in Quicksilver and then select an Applescript called "Tweet" which will take what I've written and post it on Twitter. There are lots of other places out there where you can learn more about Quicksilver. Merlin Mann is a Quicksilver guru who can do just about anything with the application. If you want to learn more check out the links below.